Growing up in a health focused household began Kristen's interest in Dietetics. She has taken that interest and combined it with personal training and psychology for the perfect DAHLC fit. 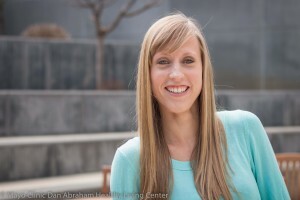 Kristen is passionate about making complex nutrition topics realistic and practical for members and enjoys helping them make those practical suggestions real in their lives. She loves how rewarding it is to be part of an institution that gives back to its employees through the resources of the DAHLC. You can find her leading a number of nutrition classes and workshops.